FORT WORTH — To many the practice no doubt seems odd at best and profane idolatry at worst, venerating body parts and/or personal belongings of saints. 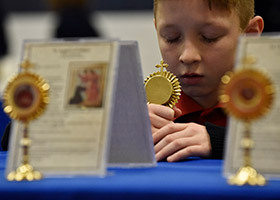 However, the function of venerating sacred relics exists solely for the sake of worshiping God, Father Carlos Martins said. The veneration of them derives from Scripture, he said. Fr. Martins is a member of Companions of the Cross and head of Treasures of the Church, an evangelization ministry dedicated to giving people an experience of God through relics of the saints. During an exposition Jan. 14 at St. Peter the Apostle Parish in Fort Worth, he discussed sacred relics and their role in spiritual life. Fr. Martins is a Custos Reliquiarum, an ecclesiastically appointed Curate of Relics with authority to issue relics. Hundreds filled the church to hear Fr. 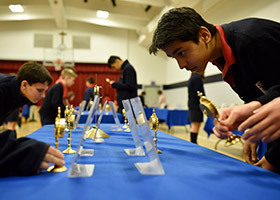 Martins’ talk and afterward filed through the church and gymnasium of St. Peter the Apostle Catholic School to experience 166 sacred relics firsthand. The word relic derives from the Latin reliquiae, which essentially means remains or something left behind. Critics of the Catholic Church claim relics are neither scriptural nor magical and liken veneration of them to superstition and idolatry. That belief overlooks both Fr. Martins’ point about relics relating solely for the worshiping of God and the Catechism of the Catholic Church’s guidelines addressing relics. Relics, Fr. Martins explained, are not magic and contain no power in and of themselves. They can assist, however, in bringing one closer to God, he said. Relics function simply as conduits or roadmaps, he said. Through relics, saints, and ultimately God, often “reach out and communicate in a very personal way,” Fr. Martins said. Fr. Martins reminded attendees that the night’s goal entailed much more than simply perusing an exhibition. “The goal is not to just come and encounter the relics of saints but that you return home a saint yourself,” Fr. Martins said. “The only tragedy in this life, and there’s only one, is to leave this life not having become a saint. Sacred relics exist in first, second, and third class designations, Fr. Martins explained. First class relics consist of the body or body fragments of a saint. 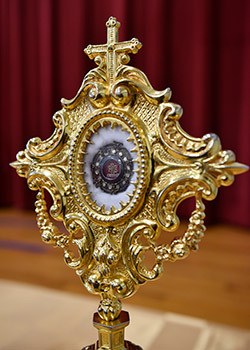 Items personally owned by a saint make up second-class relics, while third-class relics are items touched by a saint or items touched to first- or second-class relics. 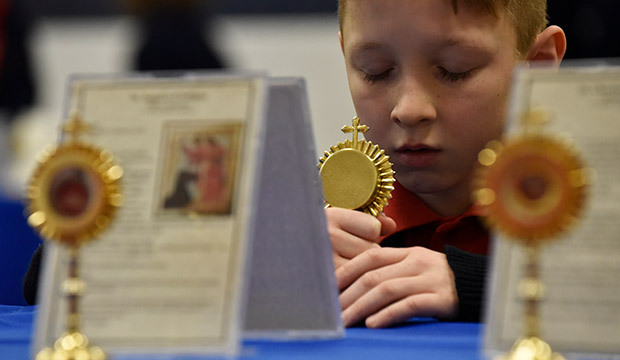 Of the 166 relics displayed Jan. 14, all but six were first-class relics. Among them were relics of St. Peter, St. Maria Goretti, St. Therese of Lisieux, and St. Francis of Assisi. Most notable among them was a piece of the veil believed to have belonged to Our Lady and one of the largest remaining pieces of the true cross. Fr. Martins discussed the scriptural basis for veneration of relics, the process of authenticating them, and their functions in individual churches. Fr. Martins discussed as well the lives of several saints and relics related to them and instances of people experiencing healing and/or life-changing experiences following veneration of a relic. Fr. Martins also spoke of what he calls roadblocks or handcuffs many place on God, preventing Him from entering their heart. These include refusal to attend Sunday Mass, to participate in the sacrament of Confession, to make a complete disclosure of sins when doing so, and refusal to forgive those who have wronged us. Fr. Martins illustrated the importance and beauty of forgiveness through the story of St. Maria Goretti. Holy Family parishioner Laura Lennarson said she had heard of, but never seen, relics before the night’s presentation. “The idea of healing and coming to them with as clean a heart as possible, what Fr. Martins called handcuffs, so that you’re able to receive the graces appealed greatly to me,” Lennarson said. St. Peter parishioner Katherine Rafferty said she prays to Jesus and the saints show up too, adding that she loves St. Paul because of his role as an evangelist. Rafferty said she and her husband have seen sacred relics in Rome and churches throughout the world, which is why they were eager to attend Fr. Martins’ event. Fr. Martins said he experiences joy through seeing the crowds his exposition attracts and their reactions to the relics.